Plano product experts bowhunt, too, which is no surprise upon first glance of the company’s new Archery Accessory Box model 1341. The first clue comes from the high impact molded case’s sleek and slim footprint, measuring in at 12.375”L x 7.25”W x 1.625”H. The size is proof that it is made to keep and carry a bowhunter’s most intimate bow and arrow tools in a single compact case. It comes with a broadhead retainer and tool for safe, easy storage and handling of the razor-edged blades. There’s plenty of space for other items too, with the user being able to customize the layout by repositioning the included dividers to vary the compartment count from as few as five to as many as 11. 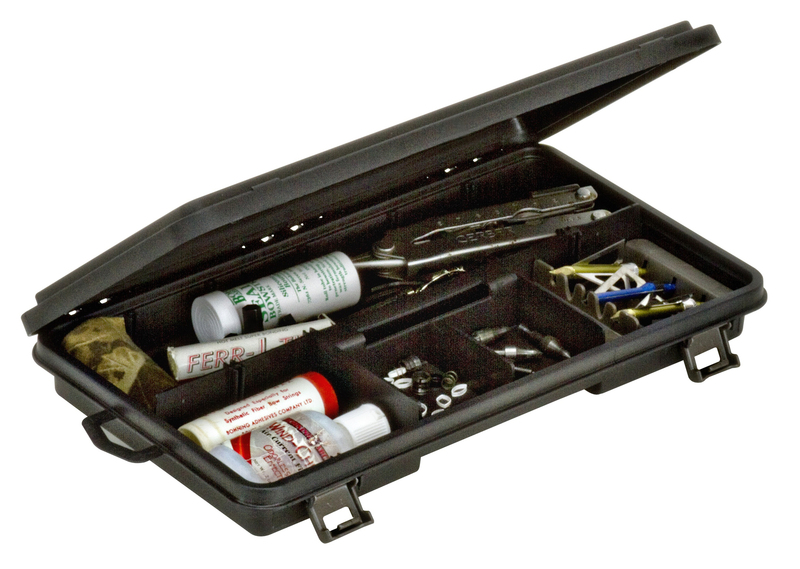 That means this accessory case is the perfect container to keep and carry in one place the most necessary essentials for maintaining bow, string and arrows in top-notch condition. Two latches provide tight and positive closure, and the case’s handle affords briefcase-type carrying convenience. The Archery Accessory Case’s slender profile allows for easy storage at home, in the vehicle or at camp. It easily fits underneath a truck seat, on a closet shelf or in a gear bag. Its black color adds to the professional tool kit look. The fact that it is a Plano means the model 1341 will be part of your bowhunting equipment for a long time. The case will be available at many of the country’s top sporting goods stores and archery shops by summer, retailing for around $9.99. For more information on the Archery Accessory Case and other Plano products made for hunting and shooting sports enthusiasts, visit www.PlanoMolding.com. Copyright © Hunt The Outdoors, LLC. Developed by Henricks Media.